Does this video show a sonic boom through a sun dog? This YouTube video purports to be of a rocket launch from the Kennedy Space Center in 2010. It shows a rocket reaching the speed of sound, and creating a sonic boom at the same time as the rocket passes through a "sun dog", and the resultant ripples appearing through the atmosphere. This video was cited on a Lithuanian technology news website, with the claim that the ascending rocket has managed to "tear a rainbow (sun dog) apart" (my translation, the headline contains other catch phrases as well): NASA raketa suplėšė vaivorykštę (Video) The article cites the expert of atmospheric optics, Les Cowley, explaining this phenomenon. The video is also referenced on It's Okay to be Smart blog. 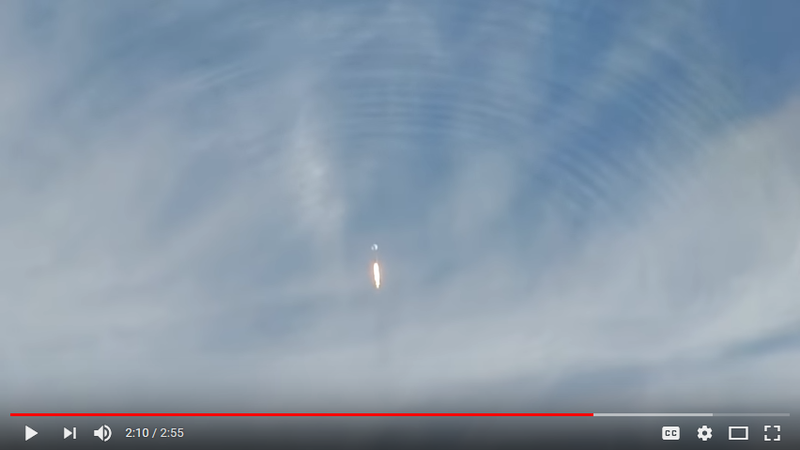 The thing is, I have seen a lot of rocket launches, but I have never seen an atmospheric ripple effect like this before and that is the thing that I'm skeptical about. Does this video show an authentic meteorological rippling effect? Browse other questions tagged physics nasa meteorology . Is this “quantum levitation” video real? Is this video from NASA proof that LENR is a real effect? Is this CCTV video about a chair moving by itself in Essex theatre fake? Does this video show a water droplet in gravitational orbit? Does the STS103-734-73 NASA picture show another spacecraft? Does this video show a very localised rain shower falling on one spot? Was this video of a home made phone charger faked?